The most common cause of gradual onset pain under the arch of the foot is Plantar fasciitis. Other injuries which cause foot arch pain include Tarsal tunnel syndrome, Medial calcaneal nerve entrapment, Tibialis posterior tendinopathy, and Navicular stress fracture. 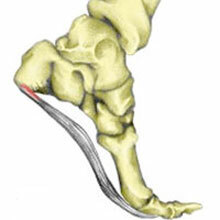 A plantar fascia (foot arch) strain is a tear of the fascia which forms the arch of the foot. Plantar fasciitis is probably the most common cause of pain under the heel which radiates into the arch of the foot. Symptoms usually develop gradually over time with the patient unable to pinpoint the exact time or cause of injury, like they might with an acute injury, such as a sprained ankle. Pain is usually worse first thing in the morning, or after a long period of sitting, and gets easier during the day as the plantar fascia (arch ligament) warms up, only for the pain to return again later in the day as it becomes inflamed again. The Plantar Fascia or plantar aponeurosis, as it is also known, is a broad, thick band of tissue that runs from under the heel bone (calcaneus) to the front of the foot, providing support to the foot when standing and acts as a shock absorber when running. Pain is caused by inflammation or degeneration of the tendon of the plantar fascia where it attaches to the heel. Repetitive stress from running, walking or jumping, especially if the athlete overpronates (foot rolls in) causes repeated stretching of the plantar fascia. Treatment involves rest, applying ice or cold therapy to reduce pain, and inflammation, taping, stretching exercises, and massage. It is also important to identify possible causes, such as training errors or biomechanical problems (overpronation) in the foot. Read more on Plantar fasciitis treatment and causes. 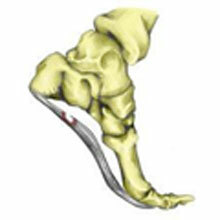 A Heel spur is a bony growth on the heel bone (Calcaneus) at the point where the Plantar fascia attaches. Symptoms of a heel spur are the same as Plantar fasciitis, but the two are not the same. Plantar fasciitis can occur without the presence of a Heel spur, and a Heel spur can occur without any painful symptoms at all. 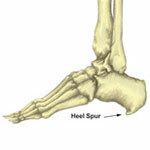 Read more on Heel spur. Tarsal tunnel syndrome is a painful condition that causes burning pain in the foot. The pain often radiates into the arch of the foot with pins and needles sometimes being felt. 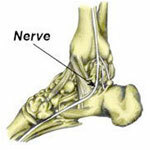 The pain is caused by pressure on a nerve which passes along the inside of the ankle. There are a number of causes of Tarsal tunnel syndrome. If you overpronate (where your foot rolls or flattens) when you walk or run then this will increase the likelihood of compression of the nerve. Other causes include arthritis, traumatic injury, cyst, and diabetes. Treatment involves reducing pain and inflammation with rest and cold therapy, identifying and correcting the causes and contributory factors then rehabilitation of the foot and lower leg with stretching and strengthening exercises. Read more on Tarsal tunnel syndrome. The aim of treatment is to reduce pain and inflammation through rest and application of cold therapy, followed by a rehabilitation program of exercises and a gradual return to full fitness. If conservative treatment fails then a doctor may inject with a corticosteroid injection and failing that, surgery to decompress the nerve. A Plantar fascia strain is a strain of the plantar fascia which forms the arch of the foot. It might result from one single traumatic incident, resulting in sudden pain, or may gradually occur over a period of time through overuse. Symptoms of localised tenderness and pain over the plantar fascia, with a nodule or lump, where it may have torn. Treatment involves rest, applying cold therapy to relieve a symptom, and taping the arch of the foot for support. After the acute phase massage may help, along with a full rehabilitation program and a gradual return to full fitness. Read more on Plantar fascia strain. 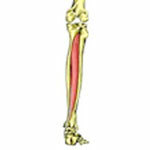 The tibialis posterior tendon passes down the back of the leg, inside the ankle, and under the foot. Overuse can cause injury or degeneration of the tendon causing pain on the inside of the ankle which may also radiate along the length of the tendon, under the arch of the foot. It is more common in older female athletes but has been known to affect younger ballet dancers. If there is significant pain under the foot then this may indicate a partial avulsion, where the tendon pulls away from the bone at the attachment to the bone. A navicular stress fracture is a hairline fracture of the Navicular bone in the ankle caused by overuse and is one of the most common stress fractures affecting athletes. Symptoms include a poorly localized ache in the midfoot, which may radiate along the inside arch of the foot. Pain becomes worse with exercise, subsides quickly with rest, only to return again as training resumes. 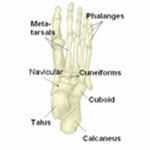 Tenderness may be felt when the thumb is pressed into the top of the foot over the navicular bone (called the N spot). Stress fractures do not always appear on X-rays until they have started to heal. Then the new bone growth can be seen. Treatment depends on how bad the stress fracture is, ranging from a walking splint to full six weeks immobilization in a cast. So it is important an accurate diagnosis is made.